Paul Dummett has welcomed new signing Antonio Barreca to Newcastle United – even though the loanee’s competing with him for a place in the team. 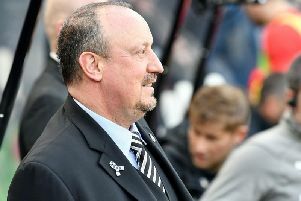 Rafa Benitez had been left without a left-back when Dummett suffered a recurrence of a hamstring problem early last month. However, Benitez – who switched to a five-man defence and fielded Matt Ritchie as a left wing-back – now has a number of options. And Dummett, set to make his comeback from injury in Saturday’s friendly against CSKA Moscow in Spain, believes the extra competition will benefit the team. “It’s brilliant,” said Dummett. “Everyone wants competition to be in the team – it brings out the best in players. “This season, when I got injured, we didn’t have another left-back. We started playing with a five and a wing-back, and it’s worked really well. Dummett has had a “frustrating” few weeks on the sidelines. “It’s been very frustrating,” the 27-year-old told NUFC TV. “As a football player, you want to be playing matches. Being on the sidelines and not being able to do it is so frustrating.